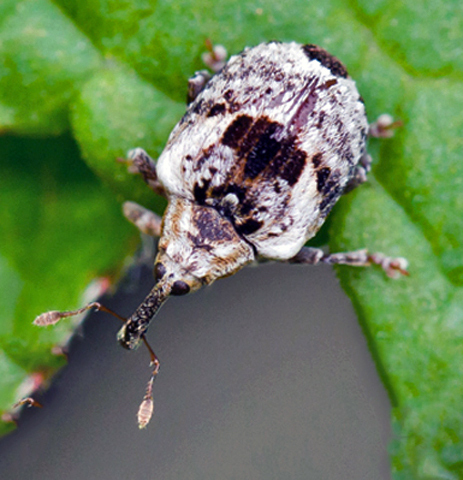 There are a number of figwort weevil species, each of which can cause damage to growing tips and flower buds of plants. in particular; Buddlea, Figwort, Phygelius and Verbascum. The adult beetles are greyish black white in colour and up to 4-5mm (1/8”-3/16”) long with one or two black circular marks where the wing cases meet. Adult weevils overwinter in the soil and leaf litter around the base of susceptible plants. There are usually two generations a year emerging in May / June, and are ever present on the plants until the end of summer. The yellowish-brown larvae that feed on the leaves have black heads, are slimy, and can grow up to 6mm (1/4”) in length. When fully grown, these spin brownish cocoons onto the plant stems, then pupate over the winter months. The best control is by removing the weevils larvae and cocoons by hand, or control by spraying with a suitable insecticide.